The OnGuard 8020 Mastiff Integrated Key chain lock offers cyclists and powersports enthusiasts a high-security option in a compact and lightweight package. OnGuard Akita Cable - 4 ft. Flexible and convenient, the OnGuard Akita 4 ft. cable enhances your locking options when it comes to securing your bicycle. OnGuard Akita Cable - 7 ft.
OnGuard Akita cable offers an extra-long 7 ft. length for plenty of flexibility and reach when securing your bicycle. OnGuard Akita Seat Leash cable helps keep your saddle secure when you lock up your bicycle. Shorter shackle and narrower crossbar fits around new standard parking meter posts, perfect for bike messengers or others who make repeated stops in urban environments. Featuring a long shackle, the OnGuard Bulldog LS U-lock provides a little bit of extra length to make it easier to secure your bike. 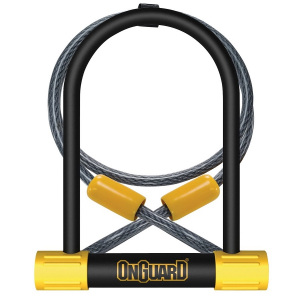 The OnGuard Bulldog STD U-lock delivers moderate security for your bicycle, resisting many types of attacks to help keep your beloved ride protected. OnGuard BullMastiff padlock bike lock offers good resistance against attacks, helping keep your valued bike secure. The OnGuard Doberman cable and keyed padlock provides light-duty security for your bicycle, all in a flexible, budget-friendly package. This OnGuard Doberman Combination cable lock uses a 10mm cable to balance weight, flexibility and convenience when securing your bicycle. OnGuard Doberman Combination cable lock boasts an integrated combo lock, making it a convenient, all-in-one option for securing your bike. Simple and secure, the OnGuard Doberman Combination cable lock offers the convenience of an integrated combo lock head along with a strong, flexible 15mm thick cable. 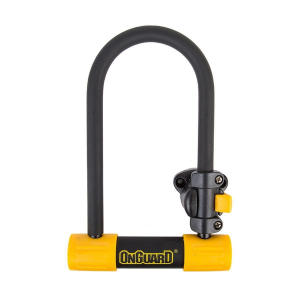 The versatile OnGuard PitBull Mini LS U-Lock combines a long shackle length with a mini-size crossbar for a long-n-lean lock design that offers great security. The Rottweiler Armored lock offers cyclists and powersports users the light weight and flexibility of a cable lock with the increased security and cut resistance of hardened steel armor.